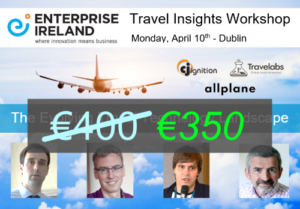 An early booking discount is available for Travel Insights Workshop in partership with Enterprise Ireland on Monday April 10th. The €50 discount (bringing the price to €350 + VAT) is available until midnight on Tuesday 28th of March. Just over a week to go! To avail of the discount click on this link or use the code EARLYBIRD during booking. Note: If you are an Enterprise Ireland client you should have already received a significantly subsidised rate, if not please contact John Magill. 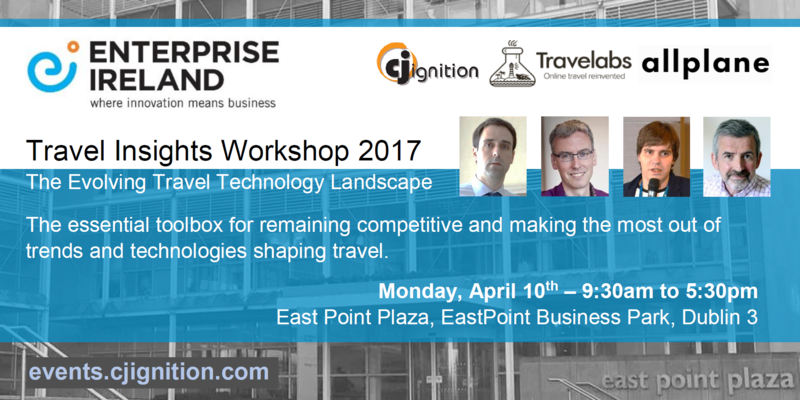 In partnership with Enterprise Ireland, the Travel Insights Workshop is coming to Dublin on Monday, 14th of April, at East Point Plaza, EastPoint Business Park, Dublin. The full day schedule runs from 9:30am to 5:30pm. A 50% discount is available for Enterprise Ireland clients, you should receive an email from Enterprise Ireland with your discount code in the coming days, if not please contact John Magill at John.Magill@enterprise-ireland.com. We are working closely with our hosting partner in Dublin and will be announcing our first date in April in the next few days. Contact lenahan@cjignition.com for more details. We are also working with potential partners in other European cities.